Southern STARRS partners with the Alvin C. York (Murfreesboro) Campus of the VA Tennessee Valley Healthcare System (TVHS) to offer therapeutic horseback riding to Veterans returning from the Iraq and Afghanistan wars. STARRS serves veterans who must overcome limb amputation, Post Traumatic Stress Syndrome, and Traumatic Brain Injury through weekly one-hour classes. The classes are conducted by a therapeutic riding instructor and VA recreational therapist team to allow recovering soldiers an opportunity to strengthen muscles, increase balance, engage in social interaction, and improve their quality of life post deployment through equine assisted activities. Building a Veteran’s confidence and relationship with the horse translates into skills that can be used in day-to-day life. We’re right here in the middle of horse country and we should have a program like this for our returning soldiers,” stated Mary Billingsly, a recreational therapist at the Alvin C. York campus. When funding became available, Mary contacted Terry Winfield, Executive Director of Southern STARRS. 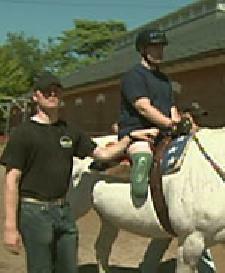 “Other therapeutic horse-back riding programs for service men and women exist throughout the country and we’ve wanted to begin one here in middle Tennessee,” said Winfield. “To our knowledge, this is the first collaboration of its kind in the middle Tennessee area.” A similar program exists in Kentucky with the Lexington VA and Central Kentucky Riding for Hope as partnering agencies.